Visa has been promoting its ongoing sponsorship of the Olympic Games with a global campaign, which features television,digital and out-of-home advertising, host market merchant activation programs and usage promotions. Focused on the Vancouver 2010 Olympic Winter Games, the Go World campaign celebrates athleticism and human triumph through unique athlete stories. It features a wintry blue tone throughout all creative executions and is being customized to maximize local relevance in key markets. The campaign also includes merchant offers, enhanced social media applications and a deeper focus on Visa-sponsored athletes (Team Visa – Vancouver). On Sunday, November 1, “Get Closer,” the first of several television commercials, aired in the United States. “Get Closer” reinforces Visa’s history of supporting Olympic and Paralympic hopefuls and connects directly with fans through a new Olympic-themed usage promotion. When United States cardholders used their Visa card between November 1 and December 31, 2009, they were automatically entered for a chance to win a trip for four to the Vancouver 2010 Olympic Winter Games. The second spot, “Anthem,” builds anticipation for the Games with images of a burning Olympic Cauldron and a montage of iconic Olympic Games moments to remind viewers of global commonalities and the power of the Olympic Spirit. Visa’s efforts in the digital space also put the athletes at the center, offering cardholders and Olympic and Paralympic Games fans a unique glimpse at the personal journey of these hopefuls. By providing this behind the scenes access, Visa reinforces its role in the Olympic Movement and strengthens its relationships with millions of Olympic and Paralympic Games fans worldwide. The campaign is online at www.visa.com/goworld, where visitors can view exclusive merchant offers, behind the scenes Team Visa – Vancouver training videos, downloadable photos of athletes in action, and athlete training playlists with songs available for purchase. Team Visa – Vancouver (US) athletes featured here include Julia Mancuso (alpine skiing), Lindsey Jacobellis (snowboard, snowboard cross), Ryan St. Onge (freestyle skiing, aerials), Angela Ruggiero (ice hockey), and Paralympian Alexi Salamone (ice sledge hockey). Athlete widgets are available for download and posting on social media networks such as Facebook and Twitter. Get closer to men’s freestyle aerialist Ryan St. Onge as he trains for the Vancouver 2010 Olympic Winter Games in Lake Placid, NY. Learn more at visa.com/goworld. Get closer to women’s snowboarder Lindsey Jacobellis as she trains for the Vancouver 2010 Olympic Winter Games in Mount Hood, OR. Learn more at visa.com/goworld. Get closer to Angela Ruggiero, defenseman on the USA Women’s Hockey Team, as she trains for the Vancouver 2010 Olympic Winter Games in Simi Valley, CA. Learn more at visa.com/goworld. Get closer to Alexi Salamone, left wing on the USA Paralympic Sled Hockey Team, as he trains for the Vancouver 2010 Paralympic Winter Games in Lake Placid, NY. Learn more at visa.com/goworld. 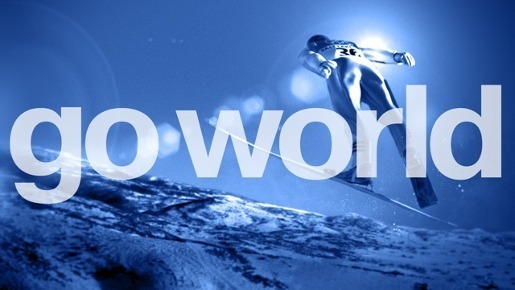 The Go World online content will also be customized for Olympic and Paralympic Games fans in Canada and Russia. In Canada, the Go World Web site features Team Visa – Vancouver athletes including Emily Brydon (alpine skiing), Clara Hughes (speed skating), Colette Bourgonje (Paralympic cross-country skiing), Brian McKeever (Paralympic cross-country skiing, biathlon), Jennifer Heil (freestyle skiing, moguls), Alexa Loo (snowboard) and Jeff Christie (luge), mentors Kurt Browning (figure skating), Nathalie Lambert (short track speed skating) and Ian Balfour (Paralympic alpine skiing), and ambassadors Jeffrey Buttle (figure skating), Danielle Goyette (ice hockey) and Diedra Dionne (freestyle skiing, aerials). Russia’s Go World Web site spotlights Team Visa – Vancouver athletes OIga Zavyalova (cross-country skiing) and Albert Demchenko (luge). The Winter Olympics campaign was developed at TBWA\Chiat\Day by global director of Media Arts Lee Clow, chief creative officer Rob Schwartz, executive creative director Patrick O’Neill, creative director Olivier Rabenschlag, associate creative directors Becca Morton and Gage Clegg, art directors Scott Brown and Clemente Bornacelli, copywriter Christine Call, designer Helena Skonieczny, executive director of integrated production Richard O’Neill, producers Rob Saxon and Jane Krull, assistant producer (Canada adaptation) Chris Spencer, production coordinator Matt Magsaysay, executive art producer (stills) Karen Youngs, management director Bill Brooks, management supervisor Nicole Bray, account supervisor Michelle Agnew, account executive Courtney Miller-Jones, executive planning director Dan Goldstein, director of digital strategy Jeremiah Knight, digital strategist Niki Weber, director of business affairs Linda Daubson, senior business manager Lisa Lipman, senior traffic manager Jerry Neill. Design and animation were produced at Superfad by executive producer Kevin Batten, creative directors Justin Leibow and Peggy Oei, head of production Angela De Oliveira, producer Camille Labouchere, editor Charles Jensen, assistant editors Jeff Jenkins and Rob Ufer. Editing was done at Venice Beach Editorial by executive producer Hunter Conner, post producer Cristy Torres, editor (Get Closer) Dan Bootzin, editor (Anthem) Billy Sacdalan, assistant editors Daniel Reitzenstein and Ted Stanley. Online editing and visual effects were producer at The Mill, New York, by executive producer Ben Hampshire and visual effects producer Asher Edwards. Music was produced at Elias by executive producer Ann Haugen, creative director Dave Gold and composer Nate Morgan.